Lewis Dunk says Albion have to build on the 3-1 victory at home to West Brom earlier this month and make the Amex a fortress this season. Since beating the Baggies, Brighton have suffered back-to-back defeats away to Bournemouth, in the Premier League and Carabao Cup, but Dunk knows home form will be key as the Seagulls bid to stay in the top flight. He feels the performance in the win over West Brom is something the team should use as a benchmark for all home matches, starting with Sunday’s game against Newcastle. He said: “We need to make it a fortress and somewhere people don’t want to come. I think that was the best we’d played in a long time, even last year. The first half of the West Brom game we were unbelievable and the way we passed the ball around I don’t think many teams could have stopped us that day. 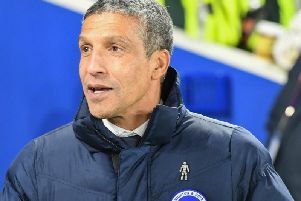 Brighton have four points from five matches this season and Dunk is frustrated the Seagulls’ points tally is not higher. Albion drew 0-0 at Watford in August, when the Hornets played with ten men for more than an hour, and then lost 2-1 at Bournemouth last Friday having led 1-0. Dunk said: “I was especially frustrated after the Watford game. They had a man sent off early and we created chances but we couldn’t capitalise. After that game, I thought it was two points dropped rather than one point gained. “But you’ve seen in this league a point is massive. Once you look back on it, it’s a good point but at the time it was very frustrating as we hit the post a couple of times and stuff like that. Chelsea loanee Izzy Brown is back in training and Brighton boss Chris Hughton will make a decision at the weekend on if he will be involved against Newcastle. Glenn Murray, Bruno and Gaetan Bong, who came through 120 minutes against Bournemouth on Tuesday, are all available.